Manama, City of Trade, Multiculturalism and Religious Coexistence is part of the Tentative list of Bahrain in order to qualify for inclusion in the World Heritage List. Just returned (November 2018) from short Bahrain trip. While in Bahrain you have to see Manama center as the majority of hotels / hostels, car rentals or bus terminals are there. I have a lot of doubts for any future inscription of this site. 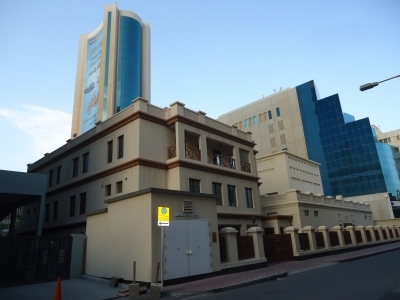 Historical places and buildings like Bab al Bahrain, located nearby old post office or old court (that you can see on the photo) seem to be well maintained but in my opinion they do not constitude any integrity. Unfortunately they are surrounded by completely new sky scrapers. Old souqs may be old but all the shops look also very modern. Older buildings - at least those to the east of Bab al Bahrain - does not look very special, just typical as in any other cities in the Gulf Region. Seeing first old quarters of Muharraq city wandering through Manama streets was somehow dissapointing. In fact even comparing different cities in the area I found central district of Muscat (with its many historical buildings, forts, sultan's palace and different ministries) much more interesting than Manama.